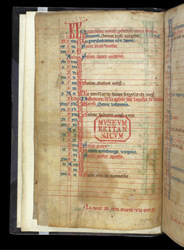 A calendar which precedes the other texts includes the dedication of the church of St. Lawrence, Ludlow (the largest parish church in Shropshire); the manuscript was undoubtedly made for use in the parish. It contains a variety of texts, all in French but not all religious--one concerns how a lord or lady show manage their estates, another gives rules for ensuring love and friendship-- which suggests that the book may was owned by a wealthy layperson, rather than a cleric. About half-way down the page, written in red ink at 13 February, is the 'Dedicacion de la eglise seint Laurence de Lodelawe'.